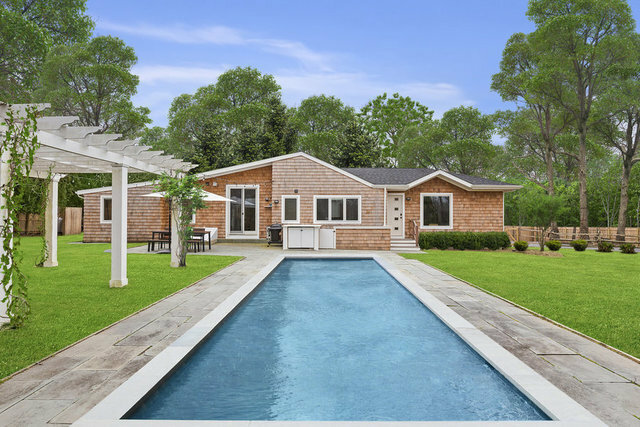 Enjoy the close proximity to East Hampton Village from this completely renovated four bedroom four bathroom modern cottage with finished basement. The new roof, windows, doors, siding, kitchen, baths, flooring, ac, landscaping and more, make this an easy choice for summer 2019. Well appointed indoor spaces with easy single story flow create an elegantly casual environment. The modern interior with NEST system is complimented well by the festive backyard space. Outdoor string lighting sets the tone for alfresco cooking and dining on the large blue stone patio. A 40 x 15 heated pool is nestled into an expansive fenced lawn with privacy screening. With ample parking for guests, this property checks all the boxes.